Helping you find the perfect home in Montgomery County Maryland including areas such as Bethesda, Potomac, Rockville, Silver Spring,Gaithersburg and Germantown. School Criteria - MLS school data may be incomplete! For the best information on homes in a given school area, contact your Realtor® at barbara@barbaraslomoff.com. © 2014 BHH Affiliates, LLC. An independently owned and operated franchisee of BHH Affiliates, LLC. 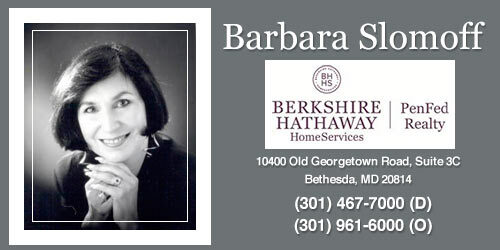 Berkshire Hathaway HomeServices and the Berkshire Hathaway HomeServices symbol are registered service marks of HomeServices of America, Inc.© Equal Housing Opportunity.